Gilbert Stuart portrayed George Washington several times in this stately, full-length English portrait format, known as the Grand Manner. 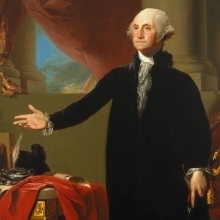 Representing Washington in the classical pose of an orator (with arm extended), Stuart added a sword, symbolic of the first president’s military victories. The dramatic setting of columns and billowing drapery is typical of European Grand Manner portraits (in particular, a seventeenth-century French work by Hyacinthe Rigaud), but Stuart included American details such as the books leaning against the table leg. The added symbolism of the rainbow in the background referred to the era of peace following the Revolution, during Washington’s terms as president. Stuart’s portrait was copied many times, and his original was reproduced in a popular print that led to the image’s fame. 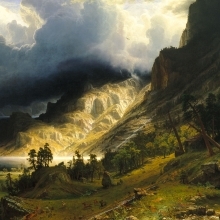 Albert Bierstadt was a skilled showman. Here, he reorganized Rocky Mountain landmarks, exaggerated their scale, and introduced dramatic weather to thrill audiences at a moment when the North American continent was under rapid development. Bierstadt’s display for profit of theatrically lit large canvases like this one was a forerunner of today’s movies. In 1863 Bierstadt made on-site studies for the work, which he completed in his New York studio. The painting had a personal significance, for “Mt. Rosalie” (now Mount Evans) was named by the artist in honor of his traveling companion’s wife, Rosalie Osborne Ludlow, whom Bierstadt would marry in 1866 following her divorce. This delicately modeled ceramic figurine depicts a bejeweled male figure emerging from a water lily. Hundreds of figurines in this style have been found on Jaina Island, just off Mexico’s Campeche coast. The island served as an elite Maya burial site. The water lily is associated with the underworld in Maya cosmology. 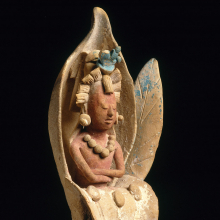 The figurine may symbolize the renewal of life after death, making it an especially appropriate burial offering. Herter Brothers was the most prestigious decorating firm and furniture maker in the United States of its time. 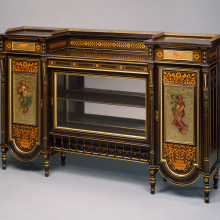 This cabinet was made for George B. Sloan, the richest man in Oswego, New York. Its form closely follows that of an example produced by the Lamb cabinetmaking firm in Manchester, England, of which Herter Brothers must have been aware. The large painted panels representing Spring and Autumn, and the smaller ones of Taurus and Leo, were probably executed by Christian Herter, a principal of the firm. This shirt may have been made for trade, because it has no embellishments that identify a specific warrior owner. The woman who made it was proficient in many techniques. 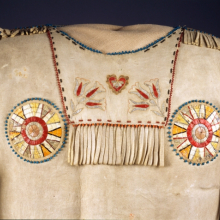 The bib is delicately embroidered with rays of traditional porcupine quills. On the bodice a two-pony-bead edging technique is used, with blue beads on the top and red garnet beads on the sides. Pony beads are so called because they were brought in by traders in the packs of ponies. The shoulder seam coverings were finely woven on a loom. Hanging tabs along the side and sleeves show pierced decorations. 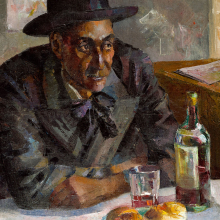 As the face of America changes and becomes more diverse, this major reinstallation of our American Art galleries attempts to take a more inclusive approach. 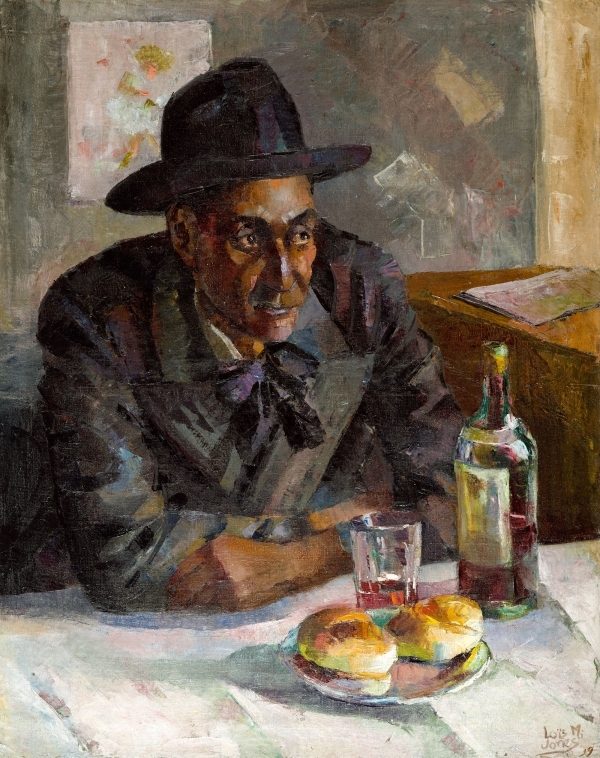 It embraces work by women and people of color and extends the definition of America to encompass not only the United States but Central and South America, Mexico, and the Caribbean basin, beginning with the art of the first peoples who lived in the region thousands of years before contact with European colonizers. Works on view include a broad range of mediums, periods, and objects, from furniture and other decorative arts, to sculpture and painting, to ceremonial and functional stone, ceramic, and buckskin works. Highlights include Gilbert Stuart, George Washington (1796); Albert Bierstadt, A Storm in the Rocky Mountains, Mt. Rosalie (1866); a Maya artist’s Figure Emerging from a Water Lily (600–900); Herter Brothers, Cabinet (circa 1872); and Red River Metis or Yanktonai Sioux artist, Dress Shirt (before 1830). The installation is divided into sections grouped by time period and related themes that include The Americas’ First Peoples (4000 B.C.E.–1521 C.E. ), From Colonies to States (including The Colonial Period in the Americas, 1660–1776, and The Early Republic, 1776–1830), Imagining the New Nation’s Landscape (1800–1880), Visions and Myths of a Nation (including Life in the Northeast, 1800–1890, and Westward Expansion, 1800–1890), Nations Divided (1860–1910), The United States on the World Stage (1865–1930), The City and the Rise of the Modern Woman (1900–1945), and Beyond Borders and Boundaries (20th and 21st Centuries). This installation of the Brooklyn Museum’s American Art collection is organized by Connie H. Choi, Assistant Curator of American Art, with Barry R. Harwood, Curator of Decorative Arts; Nancy Rosoff, Andrew W. Mellon Curator of the Arts of the Americas; Susan Kennedy Zeller, Associate Curator of Native American Art; and Richard Aste, Curator of European Art. Generous support for the installation of the American galleries as a part of the Brooklyn Museum’s Countdown to Launch initiatives is provided by Barbara and John Vogelstein, Dana Ben-Ari and Nikola Duravcevic, Tamara and Gregory Belinfanti, and Leslie and Alan Beller. Join a Museum Guide for a free tour exploring our galleries.